In each of her new sculptures, Devorah Sperber combines commonplace materials with simple optical devices in order to explore the link between art and technology, as well as the connection between subjective perception and reality. 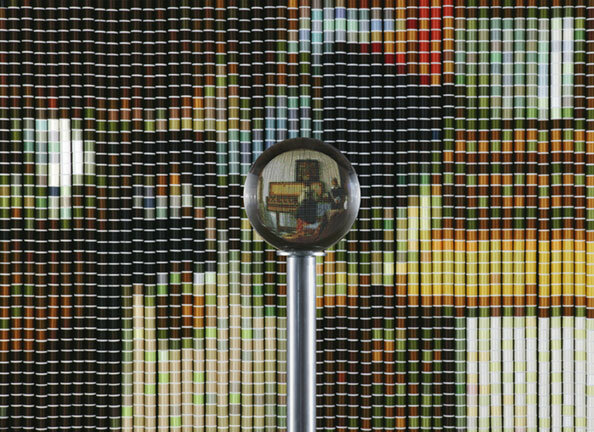 Sperber meticulously assembles thousands of elements--spools of thread or chenille stems, for example--in such a manner that a recognizable image is surprisingly revealed when the sculpture is viewed through a clear acrylic sphere or curved mirror. The subject matter of these images often contrasts with the simple, functional materials which compose the individual "pixels." This balance between ordered representation and elemental abstraction, along with a labor-intensive process of hand assembly, emphasizes Sperber's low-tech approach to science and technology. Rather than using digital processes simply for their own sake, she is more interested in exploring the blend of visual experience and intellectual concept that occurs when art and science merge. Sperber's work deftly exploits the quizzical and exhilarating moment of surprise when the external world does not align with the brain's inner expectations. This exhibition will include sculptures based on images by artists who were influenced by the optical technologies of their era: Holbein, Vermeer and Dali. In the two works titled After Holbein…, Sperber deconstructs, digitally manipulates, and reconstructs Hans Holbein's painting The Ambassadors (1533). Like the original, her work relies on the technology of anamorphic perspective. 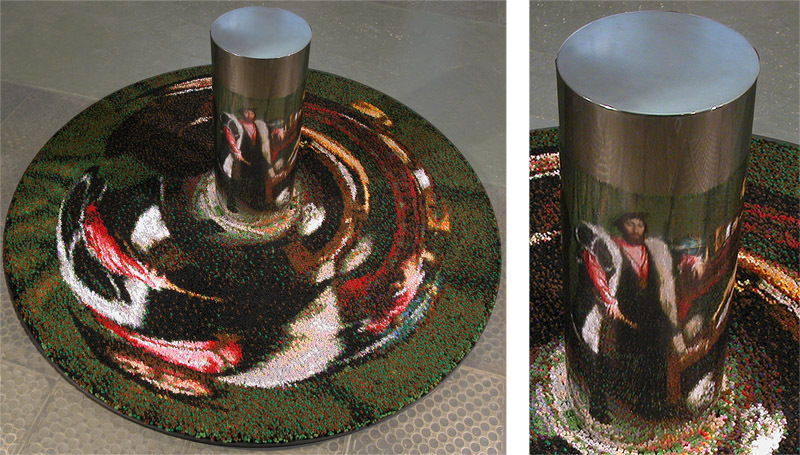 However, the images in Sperber's rug-like sculpture of thousands of chenille stems are so distended that they are only visible when seen through a cylindrical mirror or viewed from a precisely determined location. In four works titled After Vermeer…, Sperber refers to the effects of camera obscura technology, thought to have been used as a compositional aid by Johannes Vermeer. Sperber transforms The Music Lesson (1642-45) into a 7 x 7 foot circular work made from thousands of spools of thread. 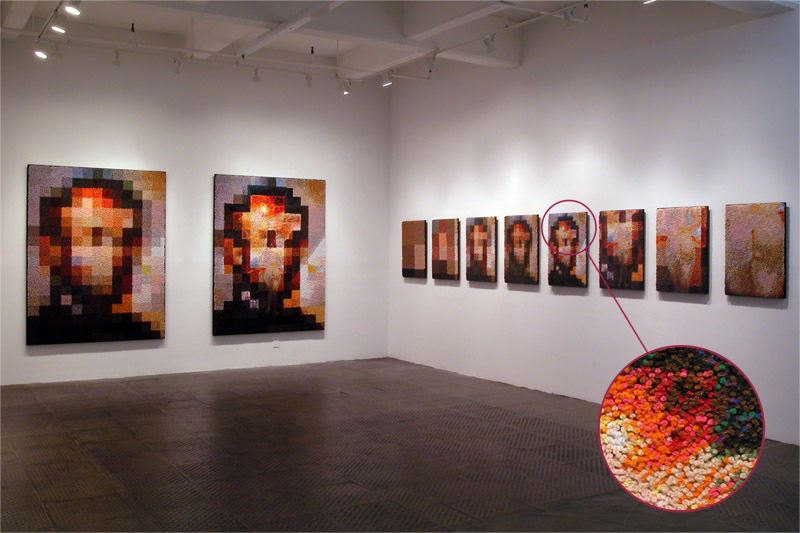 The same painting is hidden in three 12 x 12 inch circular works of thousands of 1-inch lengths of thread. 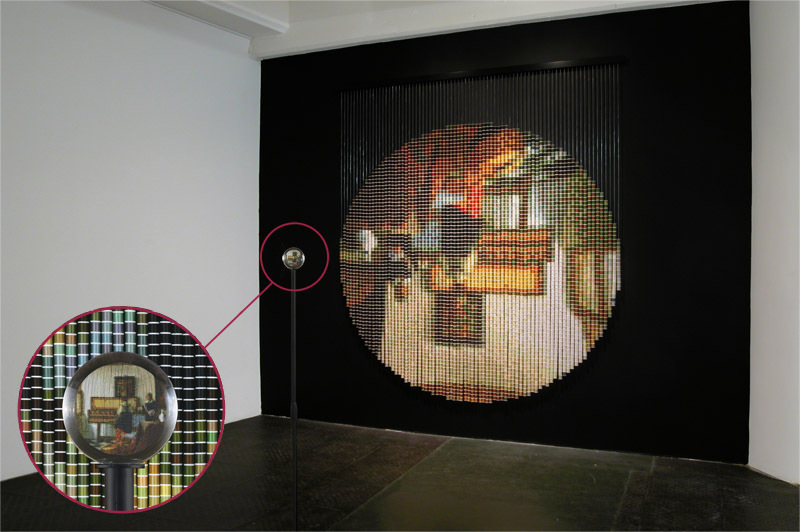 The scenes contained in each of the sculptures are made visible when viewed through clear acrylic spheres which rotate and condense the images, resulting in circular images similar to what Vermeer may have seen projected inside the camera obscura. Sperber's 10 pieces titled After Dali After Harmom use incremental cropping and scale changes to prompt the viewer to make sense of the visual imagery by relating smaller parts to a greater whole. 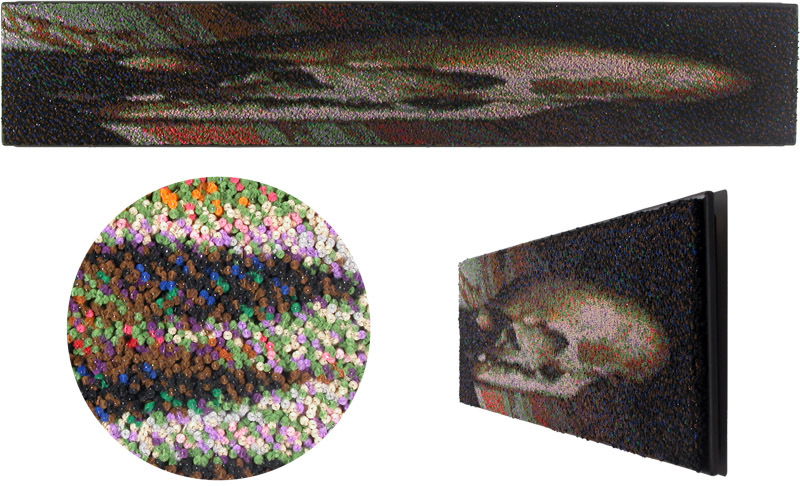 Salvador Dali's original painting from the 1970's incorporated a very early form of pixilated, computerized imagery created by Bell Labs scientist Leon Harmon.